Isn't foreign candy the best? It's always entertaining to snack on something that is only available from another country. In the case of Cadbury Dead Heads, some friends recently brought me a bag from their trip to London. I am afraid you can only buy these in the UK. It's really too bad, too, because they are a perfect combination of "delicious" and "horrifying." Just the thing for a Halloween treat. Each one is wrapped in foil printed in black and purple, with monster heads. 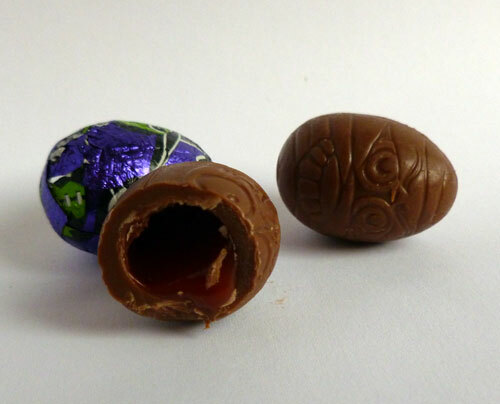 Unwrap your treat and you will find an oval-shaped chocolate printed with the same cartoonish mummy head. And inside is a reddish goo. Bite open the mummy's head and enjoy the sticky red filling!